Dramatic differences between dark and light embellish this Cassini spacecraft image of Saturn, its rings and its moons Dione and Enceladus. 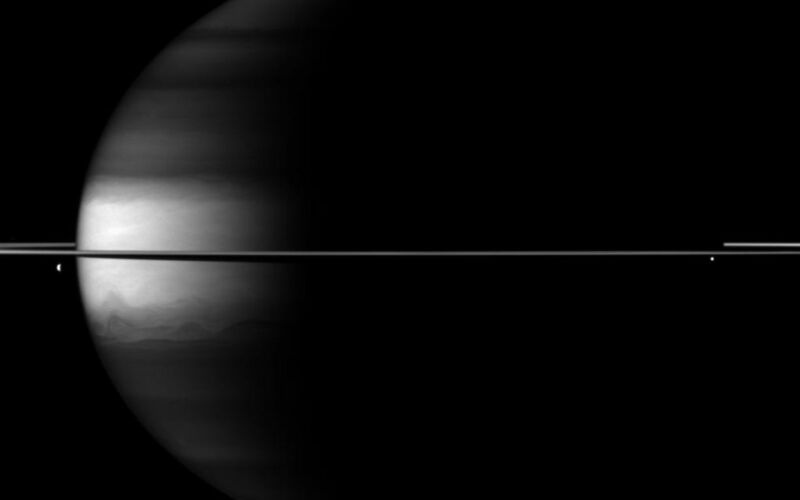 Saturn's northern and southern latitudes appear dark in this image because of the camera filter used. This view uses a spectral filter sensitive to absorption of certain wavelengths of light by methane in Saturn's atmosphere. The cloud tops in the northern and southern latitudes are at a slightly greater depth than in the equatorial region, and are underneath a layer of methane. This means that light travels along a longer path compared to the equatorial region as it enters the atmosphere, reflects off the cloud tops, and returns through the upper atmosphere to enter the camera. The light at near-infrared wavelengths thus passes through more light-absorbing methane at the northern and southern latitudes than at the equator, and so these latitudes are darker. Dione (1,123 kilometers, or 698 miles across) can be seen on the left of the image. Enceladus (504 kilometers, or 313 miles across) is visible on the right. The image was taken with the Cassini spacecraft wide-angle camera on Oct. 21, 2009 using a spectral filter sensitive to wavelengths of near-infrared light centered at 890 nanometers. 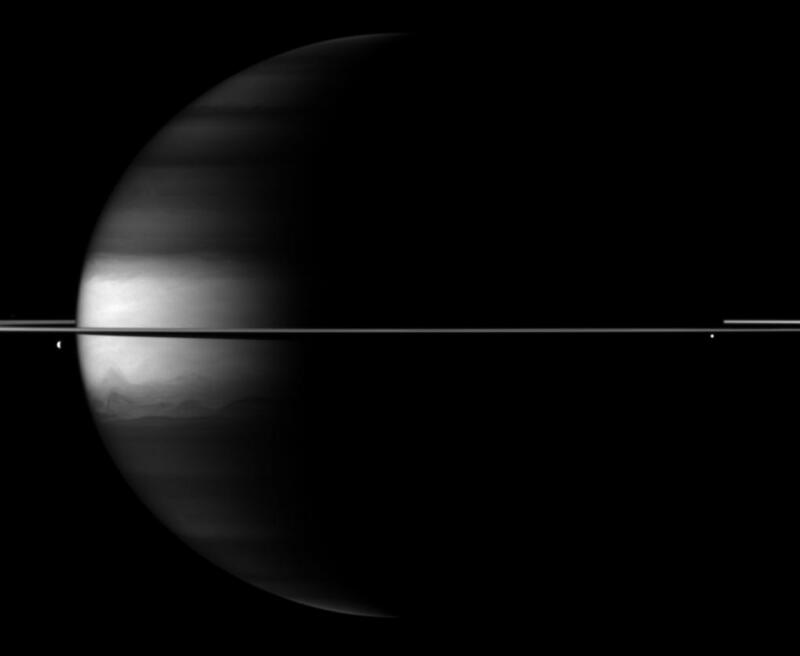 The view was obtained at a distance of approximately 2.5 million kilometers (1.6 million miles) from Saturn and at a Sun-Saturn-spacecraft, or phase, angle of 104 degrees. Image scale is 143 kilometers (89 miles) per pixel.